Home / Outdoor displays / Parasols, gazebos etc. Parasols and gazebos are sturdy enough to survive out there in the Great British Weather. They are ideal for all kinds of occasions from farmers’ markets to sports events and hospitality of all sorts. They can be printed with your branding in full vibrant colour. Established in 1993, Fresco sells good quality equipment at the best possible prices. All our displays are backed up by helpful support. 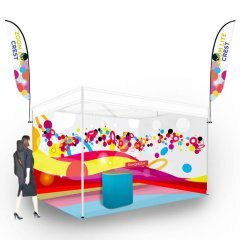 Fresco is a leading UK supplier of all types of portable exhibition displays and designs and manufactures backdrop display stands such as Curvorama and ShowSuit. Our display stands do not compromise on quality and nor does our display print.